McALLEN — More than 750 U.S. Customs and Border Protection officers will be temporarily reassigned to the southwest border to deal with what the U.S. Department of Homeland Security is characterizing as an “emergency,” according to a memo released Monday morning. DHS Secretary Kirstjen M. Nielsen said the increase in family apprehensions and unaccompanied children — asylum seekers who are turning themselves in to U.S. Border Patrol agents due to long waits at the ports — has led to a “crisis” that is “worsening.” The redeployment of CBP officers to the southwest border sectors, according to Nielsen, is necessary because Congress “yet again” failed to act. Two weeks ago, CBP officials in the Rio Grande Valley sector confirmed they had begun releasing immigrant families with “notice to appear” documents to mitigate risks at overwhelmed facilities. Some of these facilities were more than 300 percent overcapacity due to the increase in asylum seekers from El Salvador, Honduras and Guatemala. In McAllen, immigrant families are being released from CBP central processing facilities to the different respite centers operated by Catholic Charities of the Rio Grande Valley, where they are temporarily housed while they arrange plans to get transportation out of the Valley. Nielsen ordered CBP Commissioner Kevin McAleenan to “undertake emergency surge operations,” according to the release, and immediately increase the temporary reassignment of personnel and resources to address the arriving asylum seekers. The more than 750 CBP officers will be temporarily reassigned to Border Patrol sectors “that are affected by the emergency,” the release stated. The directive expressly stated CBP could raise the number of officers temporarily reassigned to the southwest border to more than 2,000. “Moreover, CBP is directed to explore raising that target, is authorized to exceed it, and shall notify the secretary if reassignments are planned to exceed 2,000 personnel,” the release stated. Nielsen also directed CBP to expand the Migrant Protection Protocols, or the “Return to Mexico” policy, a DHS program that returns immigrants to Mexico to wait for their respective U.S. immigration proceedings. The directive specifically asks CBP to “return hundreds” of migrants to Mexico, including migrants apprehended at or in between port of entries, and calls for the program’s expansion “beyond the locations in which it currently operates in California and Texas,” the release stated. President Trump threatened via Twitter last week to shutdown the southwest border as early as this week if Mexico does not stop undocumented immigrants from entering the U.S. Locally, CBP spokesman Rod Kise said Monday he was working on finding out how many additional officers would be coming to the RGV sector specifically. The release stated the redeployed CBP officers are from ports of entry in the San Diego, Tucson, El Paso and Laredo field offices. CBP indicated the reassignment will “impact” its ability to process trade and travel at the ports, but is working with the trade community, local authorities and other partners to mitigate the impact of reduced staffing at the southwest border ports. CBP and U.S. Immigration and Customs Enforcement officials said they expect the March number of apprehensions to exceed 100,000, the majority of those comprised of immigrant families and unaccompanied children. ICE announced Friday it would send about 700 adult females to the detention facility in Karnes, where about 63 people were housed as of the announcement Friday, to alleviate the issues at facilities on the southwest border. Despite the consistent drumbeat in recent weeks of a “crisis on the border” from the Trump administration, ICE and CBP, total apprehensions are still at record lows, specifically far below the levels seen the 1980s, 90s and early 2000s. In fiscal year 2018, Border Patrol recorded 396,579 apprehensions between ports of entry on the southwest border, an increase over 2017’s fiscal year apprehensions of 303,916, according to the agency’s website. The 2018 apprehension figures are still nowhere near the apprehensions reported 20 years ago, when Border Patrol officials recorded 1,579,010 apprehensions in fiscal year 1999. The second-highest year in terms of apprehensions came more than 10 years ago, in fiscal year 2007 when Border Patrol agents apprehended a total of 876,704 immigrants. On Monday morning at the McAllen federal courthouse, there were less than 15 immigration violation cases forwarded for prosecution, two misdemeanor illegal entry cases, and 11 illegal reentry cases, according to the federal court system website. The low number of prosecutions is a stark change to just a few weeks ago, when the federal public defender’s office saw on average anywhere between 40 and 100 people per day. Local representatives, including U.S. Rep. Vicente Gonzalez, D-McAllen, accused the Trump administration of “manufacturing a crisis” on the border, in order to push for more physical barriers along the U.S.-Mexico border, and to justify his efforts for a national emergency declaration. Border Patrol agents over the weekend dropped off groups of immigrant families without any documentation, something they admitted was a mistake that was subsequently rectified. 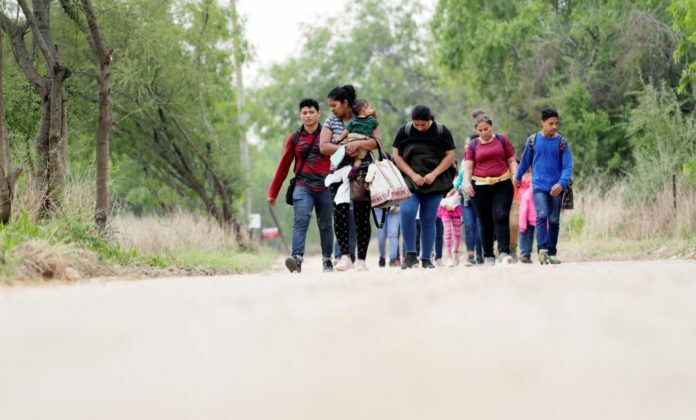 Hidalgo County Judge Richard F. Cortez last week said more than 2,000 asylum seekers had been released from CBP custody. On Monday, he said he had yet to hear from CBP or ICE regarding the releases and potential bed space accommodations. Cortez reiterated county officials were more than willing to assist their federal partners — but that ultimately any resulting consequences due to the releases are squarely the responsibility of the federal government. Monitor staff writer Daniel A. Flores contributed to this report.